Who doesn’t love the food that comes out of a deep fryer? The crispy, perfectly fried and delicious crunch is all we want. Plus, there are many fryers that use less oil and cooks food professionally. We all want the same restaurant like taste at home. Not to mention, but commercial deep fryers are too expensive. But no worries, there are some best home deep fryer that gives you perfect taste just like restaurants. But how to choose the best deep fryer that saves oil and fries fast? No doubt, there are several products available online. Each one of them have their own advantages and disadvantages. 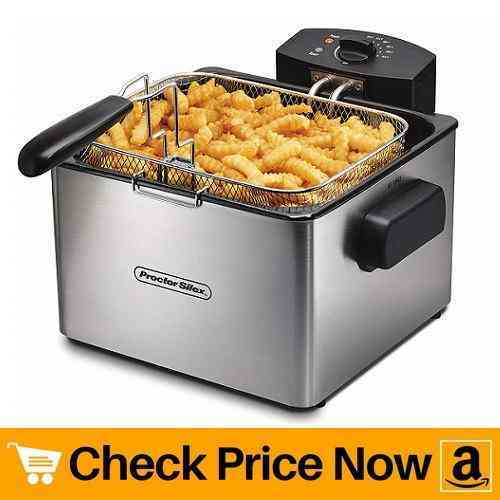 We are here to help you buy the best deep fryer of 2019. By the end, our buyer’s guide will solve certain questions regarding usage and cleaning of deep fryer. 12 11. Proctor Silex 35044 Professional-Style Deep Fryer with 5 L Capacity, Silver Color. 13.2 2. How to clean a deep fryer? 13.3 3. How to use a deep fryer? Let’s begin the detailed review. So here we start our review with t fal deep fryer. This powerful 1700 watt machine have oil capacity of 3.5 liters, whereas food capacity of 2.65 pounds. 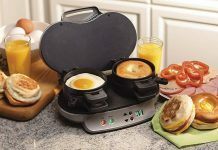 Thus, you can easily fry delicious food for friends and family. This single basket oil fryer have dishwasher-safe parts as well as handle stay cool during frying. Ultimately, it is very easy to clean. The adjustable thermostat allows you to cook meal at perfect temperature. No matter what you fry, you will always get the perfect crunch. Want to know what makes this product so special? 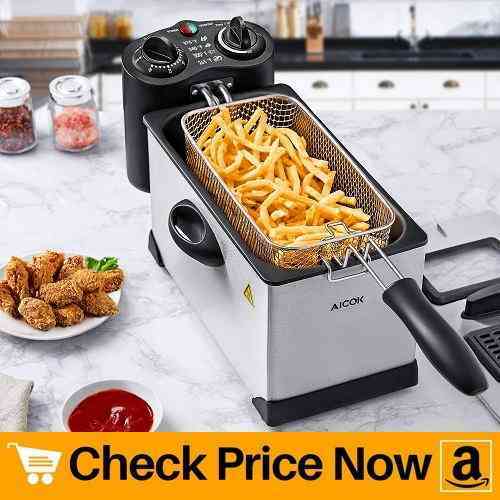 Its unique oil filtration system makes this best home deep fryer. 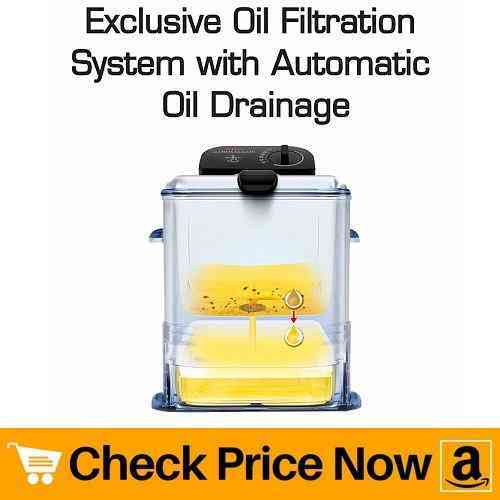 This system automatically drains and filters out oil. In addition, the filtered oil is stored inside the basket which is ready for next use. We found nothing worrisome in our review. Moving forward, on number #2 we have presto deep fryer. This model is perfect for large-size family. Stainless steel design gives it perfect professional touch. The oblong shape of baskets are ideal to cook large pieces of fish or chicken. In addition, dual baskets allows you to cook two different foods at same time. Hence, saves time. Further, you can change frying temperature with adjustable thermostat. Besides that, a signal light indicates when oil is ready for frying. Also it features preheating and fast oil temperature recovery. Thus, cooks your food fast. Charcoal air filter cover prevents oil spattering. Not only that, but it also reduces odor while frying food. Want to fry food like a professional chef? 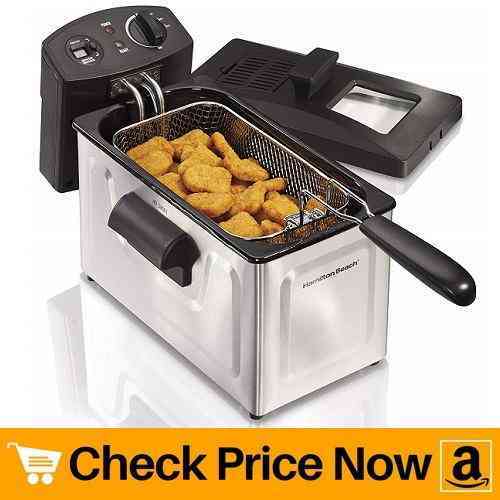 Then here we present Hamilton beach deep fryer. This model gives you 3 baskets, one large and two small. Thus, it is perfect for family with many members. This model features an immerse heating element which heats oil faster. In turn, it helps to cook perfect food in less amount of time. Further, it have an adjustable thermostat along with audible timer. You can easily set the temperature in order to get perfect crisp. What makes this model different from others? It comprises of lid with viewing window. Hence, the cover avoid splattering while the window allows you to monitor food. In addition, it comprises of power light and ready light. They indicate when the device is on, and when the food is ready to fry. If you’re tight on budget but still want mouth-watering taste, then here we have best model for you. This electric deep fryer comes with 3 stainless steel baskets. You can easily cook two different foods at same time. Thus, you get good quantity of food along with saving time. 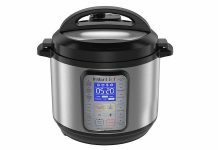 1700 watts of immersion element preheats and recovers oil temperature in matter of minutes. Hence, no need to wait for long time to get delicious food. In addition, this model have an adjustable temperature option with oil-ready light. Also the activated carbon filters effectively reduce odor while frying. Plus, it also contain viewing window which allows you to check cooking process. 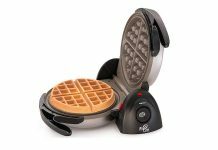 Safety feature includes an automatic timer, adjustable up to 60 minutes to shut down heating element. 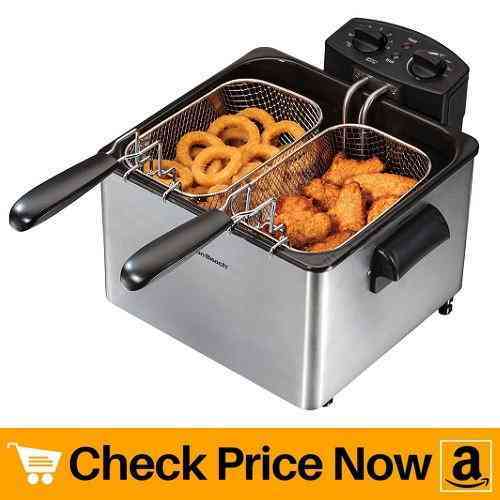 All above features makes it fall under the category of best home deep fryer. Here comes another presto deep fryer. What makes it number #5 on our review list? Let’s check it out. The simple and classic design of this model is really attractive. Besides that, it is perfectly fits on a counter-top and is very easy to use. Plus, heavy duty cast aluminium ensures durability of the product. This small deep fryer is light in weight which makes it easy to shift from one place to another. 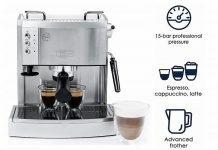 Apart from that, it uses just six cups of oil and cast aluminium maintains perfect temperature automatically. It comes with slotted scoop which helps to place and take out food from the bucket easily. Moving ahead, on number #6 we have commercial electric deep fryer. It is build with heavy duty stainless steel which makes it strong and durable for commercial use. Big and deep basket helps to fry large quantity of food in single go. Apart from that, it have tank capacity of 6 liters. Plus, the small sticker present on the top tells you best frying temperature of certain food items. The stainless steel frying baskets comes with plastic handle in order to resist high temperature. Thus, no need to worry about touching handles after the job is done. In addition, the company also provides residue plate to filter out the remnants. 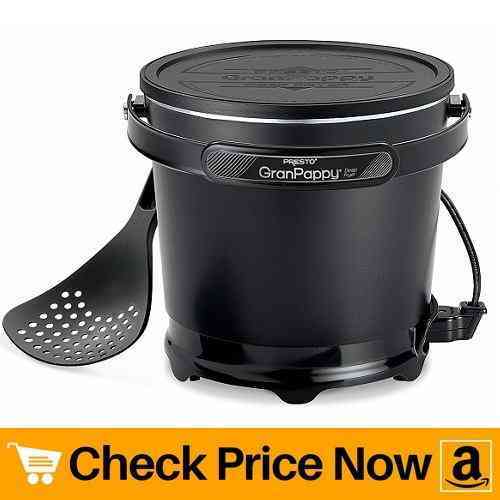 If you wish to have best deep fryer under $50, then product number #7 is just perfect for you. This electric deep fryer have immersed heating element that quickly recovers oil temperature. 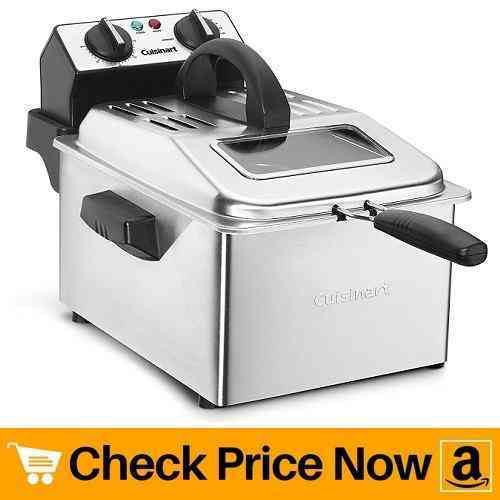 In addition, 1700 watt helps to fry food quickly and gives it the perfect crisp. Further, it have adjustable thermostat along with timer. Both these functions are easy to use. Besides that, top of fryer shows cooking degree of certain foods. Lid present on the top prevents spreading of oil while frying food. Apart from that, the viewing window allows you to monitor food without opening the cover. Thus, saves time and reduces effort. The cool touch handle prevent your hands from burning. Never touch the stainless steel surface while frying, as it gets hot. Want to have the perfect restaurant like crisp at home? 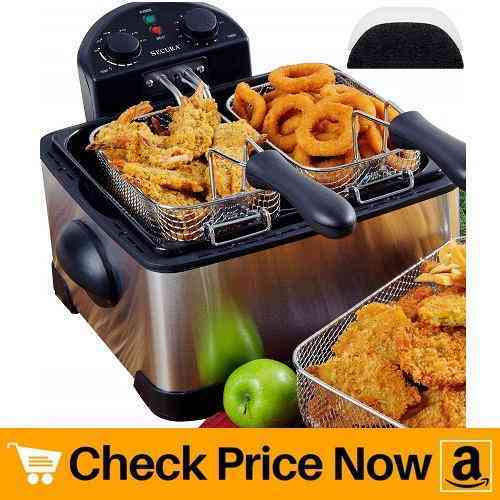 Then here we have best deep fryer that fries potatoes, chicken, turkey, donuts, vegetables and much more. The stainless steel body is durable and best suited for medium to big size family. The 1800 watt removable immersion heating element heats up fast as well as recovers temperature quickly. 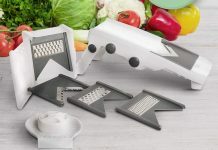 In addition, it provides uniform heat throughout cooking which makes food perfectly crispy and delicious. Further, the lid contains view window which allows to check food during frying. Also the cool handle prevents your hand from burning. It features 1 gallon removable enamel-coated oil container with pouring nozzle. 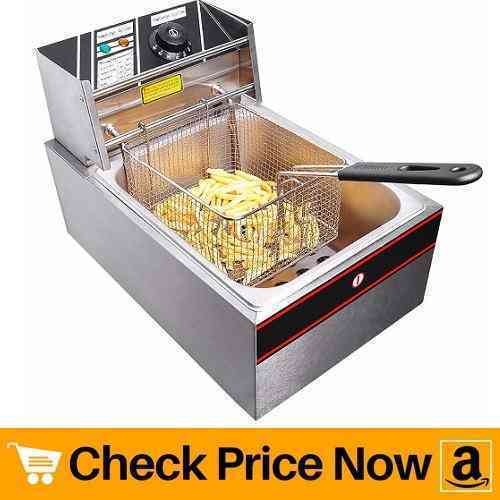 Here we have another Hamilton beach deep fryer. This model is best suited for more number of persons. Let us find out what makes it stand on number #8 in our review list. Its strong and attractive design gives professional touch. Apart from that, it perfectly fries food and gives a nice crisp. You can also say this a best restaurant deep fryer due to its similar features. Like most of fryers, this one also uses immersed heating element for fast cooking. In turn, it also spreads heat evenly in all directions for better cooking. Add oil to the device before turning it on. Once the oil gets ready, power light will turn on. This is perfect time to add your food inside the oil. Besides that, you can also set time according to the requirement. The beep sound will let you know when the frying process gets over. Once again we have a model from presto brand. 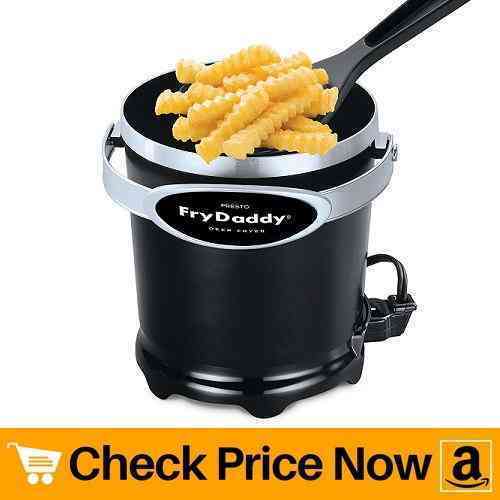 This fry daddy deep fryer is very cheap and uses less oil. Non stick surface, inside and out helps to clean the machine easily. In addition, the handy scoop lifts and drains out excessive oil. Thus, making your food healthy. In-built preset thermostat gives you best frying experience every time. It automatically sets the perfect temperature. Hence, making your chicken, turkey, fries, etc full with crisp. You can make use of leftover oil again and again. Snap-on lid lets you store oil in the fryer. Therefore, no need to strain and refill oil after every use. Further, the snap-on lid prevents odor and oil spills while frying. 11. Proctor Silex 35044 Professional-Style Deep Fryer with 5 L Capacity, Silver Color. Last on our list we have this large deep fryer. The reason we called it large because of its 5 liter oil capacity. Yes you read that right. Its oil capacity is enough to feed crowd in one go rather than frying again and again. Thus, which makes it convenient for parties or get-together. Love french fries? Then here is a good news for you. The extra-large basket of this device cooks up to 13 servings of french fries. Therefore, which makes it best deep fryer for fries lover. In addition, adjustable thermostat allows you to control cooking temperature. In turn, you get the perfect crispiness. Two handy lights indicates when the power supply is on and when the oil is hot enough for frying. Hence, helps you get best cooking experience. 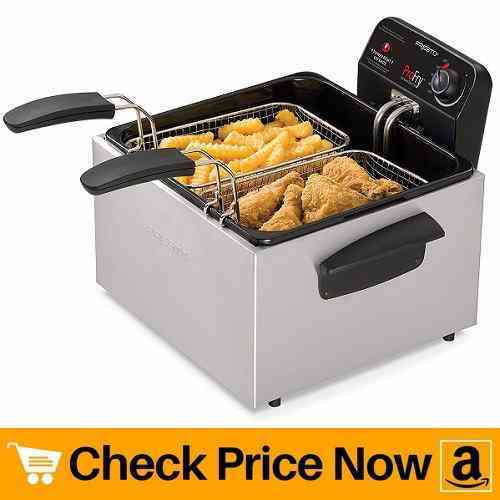 Here we end our reviews of best deep fryer of 2019. We have made our best efforts to help you buy the best product. Let us move towards buyer’s guide in order to clear some of your doubts regarding fryer. 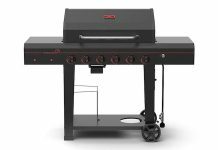 Also take a look at our list of best pellet grills and mats. Deep fryers require enough oil to completely submerge food while cooking. Whereas, air fryer require very little oil or no oil at all. You can bake and grill food using an air fryer, but deep fryers are strictly used for frying. Fat fryers gives you the perfect crunch as food is cook evenly from all sides. In case of air fryers, the food is dryer. Cleaning is much more easier in air fryer as compared to deep fryer. The main reason for it is usage of less oil. 2. How to clean a deep fryer? Cleaning a deep fryer is a time-consuming job. This is because of the presence of oil and grease. Below given are two washing methods. Generally all fryers have washable parts that are easy to remove. Once the oil cools down, collect it in a container. Now take out the basket and put in the sink along with pouring 3-5 drops of washing liquid. Keep it aside for a while. In the mean time, clean the oil from the pot and lid using only a damp cloth, paper towel or sponge. Also carefully wipe off oil from the heating element using damp cloth or paper towel. Some models come with removable heating element which is easy to wash. Check your user manual before cleaning the same. Using sponge or damp cloth to clean both inside and outside of the fryer. Now its time to clean the basket. Pour warm water over the basket and gently scrub it with toothbrush. Clean it once again with running water and allow it to dry. Clean the air filters or replace them if necessary. Allow the fryer to cool down before removing dishwasher safe parts. Now collect them and place it in a dishwasher and wash according to the user manual. For better results, soak the parts in sink for 5-10 minutes in warm water before placing them inside dishwasher. 3. How to use a deep fryer? Using a fat fryer in proper manner increases its life-span as well as maintains food quality. There are certain things to be kept in mind before using a fryer at home. Go through the following points for best frying experience. Make use of oil that have high smoke level such as vegetable oil, soybean oil, etc. Do not use olive oil as it have very low smoke point. Fill the deep fryer with sufficient oil before turning the device on. Never turn on the fryer prior before adding oil as this will cause serious damage to the unit. Allow the oil to heat up properly before adding food. Many models have a ready-light which indicates oil is properly heated. Make sure your food is dry. Properly dry-coat your chicken or turkey before adding it to fryer. In case if it contain any moisture, it will result into oil splattering. Add your food in the basket and carefully lower it into hot oil. No need to hurry. View the food from the window on the lid or set a timer if necessary. Now carefully lift the basket and drain out excess oil from it. Let the food get dry for little while before consuming it.